Looking for some spooky reads this Halloween? Here are some of our favourite books to help you get into the Halloween spirit. When trick or treating is over and the kids have had their fill of sweets, what better way to carry on the Halloween fun than a spooky book. 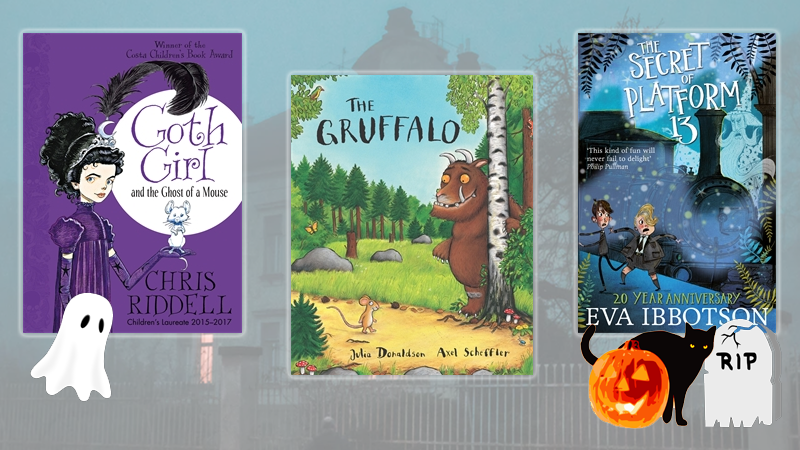 From witches and wizards to ghosts, ghouls and a Gruffalo, our list of Halloween children's books are perfect for a spooky bedtime story. There’s a spider in this book. Are you brave enough to take a look? Eric the spider can’t understand why people scream and run away from him. He only wants to say hello. But Fluffy the cat wants to eat Eric, so he’s hiding. It’s up to the reader to find Eric on every spread and maybe finally catch a glimpse of him with the surprise lift the flap ending . . . When it's time for us to go to bed, owls are just waking up and one curious little owl is ready to discover the wonders of night-time. But where are all the other owls? When we are fast asleep in bed, the Midnight Library springs to life. The little librarian and her three assistant owls help each and every night-time animal to find the perfect book. But with a noisy squirrel band, an upset wolf and a slow-reading tortoise to help, they could all be in for a very busy night. Jake is baking a birthday cake for his best friend Sam, but when his friends help out, things turn rather monstrous. With spider legs, rotten eggs, slugs and slime, Sam is in for a very smelly surprise. Rabbit borrows a book about wolves from the library, but soon a sinister figure with sharp claws and a bushy tail starts to creep right off the pages . . . Rabbit's book has come to life! Have you meet the Gruffalo who lives in the deep dark wood? With his terrible tusks and terrible claws and terrible teeth in his terrible jaws, it's no wonder fox, owl and snake are all terrified of him! The witch and her cat love flying over forest, rivers and mountains on their broomstick until a stormy wind blows away the witch's hat, bow and wand! They are retrieved by a dog, a bird and a frog, who are all keen for a ride on the broom. They climb on, one after the next, until the broom is so heavy that it snaps in two! What will happen next as they tumble into a bog and meet a greedy dragon looking for a snack? When Jack (of the beanstalk fame) spots Anansi, the new kid in town talking to a troll in the Deep Dark Woods, he becomes suspicious. Everyone knows that trolls mean trouble, and Jack will do anything to prove to the rest of his friends that Anansi is a troll spy. A spooktacular collection of poems about all things creepy - from ghosts and ghouls, to witches and vampires. is ever quite the way it seems . . .
Fredegonda, Goneril, and Drusilla are Great Hagges. They think that ghosts these days are decidedly lacking and it's time for them to learn a thing or two about being scary. And what better way to teach them than to set up their very own school for ghosts? There are musical goings-on at Ghastly-Gorm Hall and a spooky mystery for Ada Goth to solve in Goth Girl and the Sinister Symphony, the fourth book in the Costa Children’s Book Award winning Goth Girl series by Chris Riddell, Children’s Laureate 2015-2017. Under Platform 13 at King's Cross Station there is a secret door that leads to a magical island that appears only once every nine years. And when it opens, four mysterious figures step into the streets of London. A wizard, an ogre, a fey and a young hag have come to find the prince of their kingdom who was stolen as a baby nine years before. But the prince has become a horrible rich boy called Raymond Trottle, who doesn't understand magic and is determined not to be rescued. Makani Young is still adjusting to her new life after moving to Nebraska from Hawaii. However, one by one the students begin to die in a series of gruesome murders and Makani doesn't know who's next on the list. This school year may turn out to be one to die for . . . Literally. In every generation on the island of Fennbirn, a set of triplets is born: three queens, all equal heirs to the crown and each possessor of a coveted magic. But becoming the Queen Crowned isn't solely a matter of royal birth. Each sister must fight for it, starting on the night they turn sixteen . . .